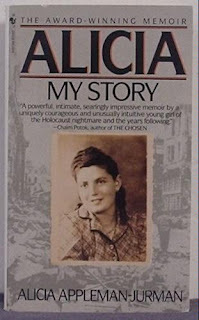 When my father was eight-three years old he read his first book, Alicia, My Story, by Alicia Appleman-Jurman. 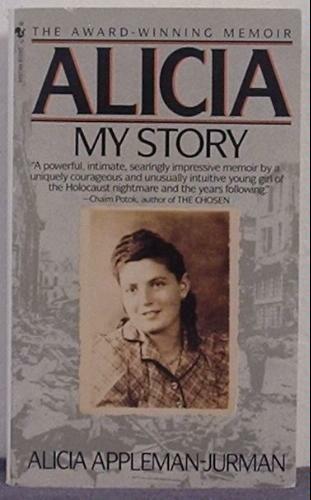 My daughter-in-law was reading the book and my father noticed that the photo on the cover looked a lot like my mother who had died recently. My dad asked to borrow the 433 page book, and finished it a couple of weeks later. When I asked my dad why he hadn't ever read a book before, he just said that he always had other things to occupy his mind. Alicia started him on a book reading project. Before he died seven years later he had read thirty-two books, many of them classics such as Silas Marner and To Kill a Mockingbird. This morning at 6:30 I was down on the dock at the Ocracoke Working Watermen's Exhibit (formerly Jack's Store). Heather King and Jim Howard with WITN, a popular eastern North Carolina television station, were on Ocracoke for their "WITN News at Sunrise" program. It was the perfect setting. The lighthouse stood watch in the background, sailboats were anchored in the harbor, and one of our local fishermen motored by during the filming. Kenny Ballance, our chief island ranger, was interviewed just at sunrise (the beam from the lighthouse was still shining over the water). Shortly afterwards our championship baseball teams were featured. Then I had a couple of minutes of fame as Heather King asked me about our popular Ghost & History Walking Tours. Of course, I had to tell her a little bit about Mad Mag Howard, one of our most popular island ghosts whom some folks tell me still prowls among our many family graveyards. They might even post videos of some of the interviews later on. "There are a number of legends concerning the origin of the name [Kill Devil Hills]. It is said that sailors stated that this portion of the sound was enough 'to kill the devil to navigate.' William Byrd of Virginia in 1728 reportedly referred to the rum in the area as being so bad that it would kill the devil. "Also, a ship carrying a cargo of this 'kill devil rum' wrecked on a nearby beach. While guarding the cargo of the wrecked ship, the guards reported that portions of the cargo would mysteriously disappear at night. A local resident named 'devil Ike' stated that he would guard the cargo, and while standing guard he discovered that another local person was tying a rope around the cargo and pulling it away by using a horse. Ike succeeded in frightening away the would-be culprit and not wanting to implicate a neighbor Ike stated that the devil was stealing the cargo and that he (Ike) had killed the devil. "Another legend states that a local resident made a pact with the devil -- the man's soul for a bag of gold - and the exchange was to be made on top of what is now Kill Devil Hill. The day before the exchange was to take place, the local resident dug a hole from the top of the sand dune to the bottom of the sand dune. When the 'banker' and the devil met for the exchange, the devil was coaxed into the hole and was quickly covered with sand. "The term 'kill' is a Dutch generic term meaning stream or channel and the term 'devil' is used to refer to a sand spout or whirling dervish. While the combination of these two terms in this area utilizing their meanings is plausible it is not likely because there was no Dutch influence in the area. "A more acceptable explanation of the name origin is that the area was once the home of many Killdee or Killdeer, a common shore bird, and the name evolved from Killdeer Hill to Kill Devil Hill." I still think the name comes from "kill-devil rum!" In his book "The Big Oyster," a history of New York City told through the story of the oyster, Mark Kurlansky recalls New York's proliferation of taverns selling inexpensive rum during the colonial period. I read on page 86, "New York rum had to compete with New England rum called "Kill-devil" that was only twenty-five cents a gallon...."
Immediately I was reminded of our Outer Banks village, Kill Devil Hills. For some reason I had never thought much about the name or its origin. Since kill-devil was the name the English and the colonists used for all cheap booze I surmised that that must be the origin of the town's name. 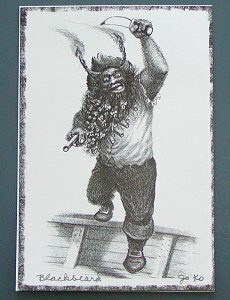 Sure enough, several sources suggest that colonial Outer Banks scavengers and salvagers hid kill-devil rum in the dunes after taking it from ships that wrecked on returning from the West Indies or New England. Thus the colorful name. Maybe many of our readers already knew this tidbit of North Carolina coastal history. But I did not. As they say, you're never too old to learn something new. Look for more legends about the origin of the name Kill Devil Hills in a future blog post. The Ocracoke Preservation Society has begun their summer "Porch Talks" (actually, these informative talks are given in the back yard). They are a great opportunity to hear many fascinating stories about Ocracoke and the Outer Banks. Today at 11 am National Park Ranger Dave Frum will be telling about his experiences working on Portsmouth Island, and will share insights about daily life in this village before the last residents left in 1971. On Thursday, also at 11 am, I will be talking about the US Life Saving Service, including a brief history of the service, their contributions to life on Ocracoke Island, and stories of shipwrecks and the remarkable bravery and courage of the life savers. These programs are free, and everyone is invited. Hope to see you there! I took my skiff out in Pamlico Sound yesterday to do a little clamming. David & Lachlan went also, along with Lachlan's friend Mariah Daisy and her extended family. We harvested a mess of clams in a relatively short time, then swam around and enjoyed the day. It was gorgeous out in the water, by the way. We were gone from the dock about three hours. Near the end of our time clamming David pulled a horseshoe crab up with his rake. As he pulled it to the surface the crab (it's not really a crab, by the way) swam away and settled down on the bottom. I reached down and picked it up by its tail to show to the children. They were all impressed. 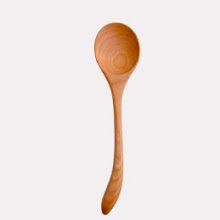 I didn't have a camera with me, so I have downloaded a photo from Wikipedia. 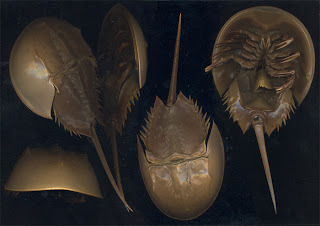 Horseshoe crabs are arthropods, and are more closely related to spiders and scorpions than other crabs. Because they have remained relatively unchanged for 450 million years they are often described as living fossils. When we released the horseshoe crab (Limulus polyphemus) it went right to the sandy bottom and reburied itself. You never know what adventures you'll have poking around in the sound! Very often I post on this blog betimes. In fact I did today. Do any of our readers know what I mean? (No fair doing an Internet search!) If you are from an old Ocracoke family you might know this uncommon word. Leave a comment if you think you know. I just recently learned that I have a 3rd cousin, once removed, named Queen Victoria. She was the great-great-great-great-granddaughter of William Howard, Sr., one time owner of Ocracoke Island. I also have an Ocracoke relative named Napoleon Howard...and another one named Lafayette Howard. I also have a few kinfolk with relatively uncommon biblical names, including Abner, Amon, Enoch, Dorcas, and Solomon. Yesterday a visitor to the island told me about her relative, King Solomon Howard. I couldn't fit him in the family line, but I think there is a good chance he's kin somehow! One day I plan to write a monthly Ocracoke Newsletter about unusual Ocracoke Island names. In the meanwhile, take a look at our latest Ocracoke Newsletter, Molly Lovejoy's 2012 Ocracoke School Valedictory Address. You can read it here: http://www.villagecraftsmen.com/news062112.htm. Ocracoke Alive, sponsor of the annual OcraFolk Festival, recently sent us notice about one of their new endeavors. In order to help keep the festival spirit alive even after the music and craft sales are over, a few festival items have been posted online at Ebay. All the items have been donated by artists or businesses who want to help support the OcraFolk Music and Storytelling Festival. So, check out this link to bid on some fine handcrafted items. More items will be posted as the summer progresses...Keep checking back! Visitors to Ocracoke often ask about the quality of education on the island. Ocracoke School is the smallest K-12 public school in North Carolina. Nevertheless, island students frequently garner significant academic awards and recognition. Among this year's graduating class of seven, valedictorian Molly Lovejoy will be attending Emerson College in the fall. She has given me permission to publish her valedictory address as our June Ocracoke Newsletter. You can read it here: http://www.villagecraftsmen.com/news062112.htm. As you will read, Molly's speech celebrates many of the qualities that make Ocracoke special, and that keep our school and our community vibrant and creative. A reader of yesterday's blog asked about the artist Jo Ko. This is what she wrote: "I have been looking around this delightful page because it came up in the search I am doing. I recently purchased a pencil sketch of a goat herder which is signed "JoKo". So far I haven't found anything on this artist except a rather disjointed connection to Ocarcoke Island. Could you shed some light on this artist? Was he/she from your area? Thank you for your time." Joseph and Esther Koch lived in Ohio (Akron if I am not mistaken). They discovered Ocracoke many years ago, sometime after World War II. Joe was an artist, and he made many pencil sketches of Ocracoke village, the beach, and colorful island characters. He signed his drawings "Jo Ko." In the 1960s Joe and Esther purchased property on School Road (where Deepwater Theater and Books to be Red is located today) and on the corner of School Road and Highway 12 (where Spencer's Market is today). 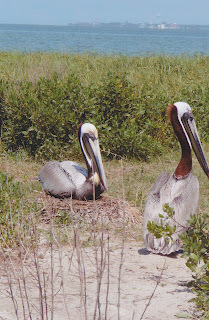 Health concerns kept the Kochs away from Ocracoke for the last 25 years or so. Over the years they sold all of their island property. Esther died a number of years ago. Joe died in March of this year, just short of his 105th birthday. You can read a little more about Jo Ko here: http://www.ocracokecurrent.com/27093. By the way, I don't remember ever seeing one of Joe's drawings with a goat in it, but maybe it is not an Ocracoke scene. Or perhaps it is. There were still semi-wild goats roaming on Ocracoke "down below" (on what is now National Park Service property) when Joe first discovered the island. "Wash 2 quarts of coquinas, then add 2 c. water and simmer for 15 minutes. Strain and save only the liquid. Dice and cook: 1 fair sized potato, 2 carrots, and 1 rib of celery. Fry: 2 strips of bacon (crisp) and 1 sliced onion (medium-sized). Combine everything with a dash of salt and pepper." If you do an Internet search you will find a number of similar recipes. Most suggest that you discard the meat of the coquina. If I remember correctly, when we made coquina chowder many years ago we extracted the meat and used it in the chowder, but it was a long, arduous task. It was tasty though! The tide washes up onto the beach, then recedes. As I walk along the tide line I see the shore come alive with hundreds of sparkles as tiny clams emerge from the wet sand. Another wave washes across the mollusks and they disappear, only to reappear moments later. I can't remember when I've noticed so many coquinas, these small colorful bivalves that flourish at the edge of the beach. As I walk a mile along the ocean I must pass many thousands of them, most in clusters, others spread out in a wide pattern. These clams, coquinas we call them, go by the scientific name Donax Variabilis. Some are yellow, some pink, others blue. Some have concentric designs, others show a sunburst pattern. They are tiny, but tasty. It's been years since I've had the patience to make coquina chowder, but it is just as delicious as traditional clam chowder. In some parts of the country folks admonish us to stop and smell the roses. If you are on Ocracoke I suggest you stop and admire the coquinas. They are quite a marvel. On Friday night the Community Square was transformed into a wrestling rink with ample room in the parking lot for fans and spectators as the 4th annual Ocracoke Women's Arm Wrestling Tournament kicked off. If I heard correctly, this is the biggest Women's Arm Wrestling Event in the U.S., maybe in the world! The two referees were absolutely serious about the rules. Kim wa on "Cloud Nine"
This year's winner was Eliza, one of our outstanding summer lifeguards. She's petite...but she put the competition away in a jiffy. I am sorry that I don't have her photo to share. However, you can see her this season on the lifeguard stand.We hope none of our readers will need Eliza's services at the beach, but if you do, you can be assured that she is definitely in shape! What a fun evening...one more unique event that sets Ocracoke Island apart from the rest of the world! I wasn't going to post this morning, but I do want to say, look for photos of last night's Women's Arm Wrestling competition soon. 'Nuff said. It has been windy...yesterday and today. It has been blowing 20 - 30 mph, with gusts up to 35 mph. Of course, strong wind is not uncommon on Ocracoke. In fact, I've written about wind dozens of times on this blog. My post for August 3, 2006 was even titled "A Flaw of Wind." In case you haven't read that post (or may have forgotten it), a flaw of wind is a sudden gust. The expression, though archaic, is still used on Ocracoke. "But anon after there arose (against their purpose) a flaw of wind out of the northeast." Acts 27: 14 from the first New Testament published in English, 1525-1526, translated by William Tyndale. Both the King James Bible and the Revised Standard Version of the Bible replace "flaw of wind" with "a tempestuous wind." "Before the Juno's people were all off the yards, a sudden flaw of wind drove the ship astern." Don't be surprised if you hear an O'cocker talking about a flaw of wind! They're common out here. This past Sunday I posted a few paragraphs about our lighthouse and the hours it will be open this summer for viewing the interior. Below are a few more interesting facts about the lighthouse. The appraised value of the land was $1,000. This information was quoted by Ellen Fulcher Cloud in her book, Ocracoke Lighthouse, from records in the custody of the Commissioner of the Revenue, in the Department of the Treasury. "Fences were important when the ponies dashed wild and free up the sandy lanes. They helped themselves to any food they could find. From a garden or through the kitchen window, the aroma of dinner drew a hungry horse's nose to attention. The people fenced themselves in." Ocracoke Preservation Society's summer Porch Talks continue to inform and delight. Tomorrow, Tuesday, June 12 at 11:00 am Gene Ballance will share information and stories about OYSTERS ON OCRACOKE. 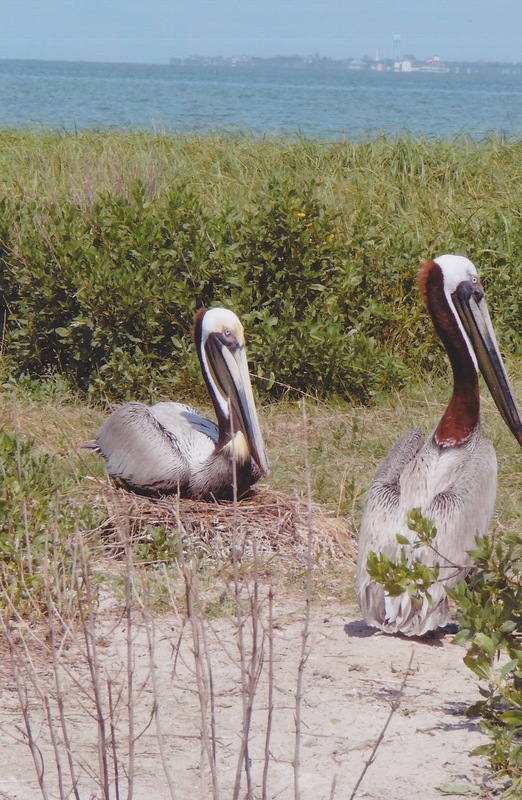 On Thursday, June 14 Elizabeth Hanrahan will give a presentation on WHITE BIRDS OF OCRACOKE. This is also at 11 am. Porch Talks are in the back yard of the OPS Museum. Congratulations to Ocracoke High School's senior class of 2012! The commencement ceremony was, as you might expect, exceptionally personal since there were only seven graduates. I turned to my neighbor as they were handing out diplomas (each graduate received personal congratulations and/or hugs from the local ministers, the chairman of the school board, the county school superintendent, and the principal) and said, "I'm glad there aren't 400 graduates!" "They'd be doing this differently if there were 400 graduates," he responded. All the best to Echo Bennink, Virginia Downes, Leslie Espinoza, Cassandra Hagins, Molly Frum Lovejoy, William O'Neal, and Ashley Salinas-Lopez! Look for Molly's Valedictory Address in our upcoming Ocracoke Newsletter. It captured all that is wonderful and special about this island community. Just yesterday I spoke with Ed Johnson, one of the volunteers in the Park this year. We were talking about the Ocracoke Lighthouse, and he told me that the base of the lighthouse is open Thursday - Monday, 1 pm to 4 pm. If you have never had a chance to see the inside of this historic structure, please keep this schedule in mind. Their plan is to maintain an "open house" all summer. Please keep in mind that the age of the stairs, the configuration of the lantern room, and other architectural features of the lighthouse do not permit allowing visitors to climb the spiral stairs. It is still fun, interesting, and historically educational to step inside and chat with a volunteer. Just a quick note this morning. The Community Square is hosting a second Homegrown, Handmade, Fresh-Caught Market this morning from 8 to 11. If you are on the island be sure to stop by to see what islanders are offering for sale. Last month there were bird houses, paintings, drawings, plants, weavings, and handmade T-shirts among other items. No yard sale goods will be included. Visitors to Ocracoke have many choices when it comes to lodging -- motels, cottages, B & Bs, and campsites. We don't have any chain motels, but we do have accommodations to suit almost any taste. Cottages range from the elaborate (with Jacuzzis, theater rooms, and pools) to the simple (without air conditioning, Internet, or telephone). If you are looking to get away from it all, consider the Hurricane House. This is a traditional, no-frills island home with a screened porch (for enjoying some of the most spectacular sunsets anywhere) and a delightful outdoor shower. It sits at the end of a dead end road right on the edge of the Pamlico Sound shore. The Hurricane House is not for everyone, but for the right folks it can be the perfect house. For more information click here http://www.ocracokevillage.com/cottages.htm and scroll down to #9, "Old Island Home." Also look for more information about how this house got its name in our upcoming June Newsletter. This is much more fun than that old picture where you tried to find the man's face in coffee beans. Every so often a clever picture comes along that camouflages something for us to find. This is one such picture. If you find the lobsters in 5 minutes, the left side of your brain is normal. I looked for 15 minutes and couldn't find them. I guess my brain is "abnormal." I am told women find the lobsters much quicker. It probably has something to do with the wiring in the brain. The other day Lachlan asked me if he could play a computer game. I forgot that the above-mentioned email was open on my laptop. I walked into the room just as he was finishing reading and looking at the email. "I don't see any lobsters," he said without a hint of irony! Donald Davis' Storytelling Workshop group is back on the island...and you are in for a treat. This week (today, June 6, and tomorrow, June 7 at 10:30 a.m.) participants in the workshop will be sharing stories at the Ocracoke Preservation Society Museum (across the parking lot from the NPS Visitors Center). On Thursday, May 22 I posted something I discovered with my new e-reader and "War and Peace." You can read it here: http://villagecraftsmen.blogspot.com/2012/05/nookd.html. Since then the story has been picked up by a number of "tech blogs" and other Internet sites. Prior to my "Nookd" story the most page views I have ever had for one post was 567 (January 2011 snow storm photos). As I write, I have now had more than 57,000 page views of the "Nookd" post! I think my story is going viral! To see what I mean, simply do an Internet search for "Nookd." Tomorrow evening we in North America have the opportunity to watch the last Transit of Venus that will occur in our lifetime. Transit of Venus is the name given to the rare celestial event when the planet Venus passes directly between the earth and the sun. I understand that Venus will appear as a small dark sphere in front of the orb of the sun about two hours before sunset and lasting until the sun disappears. Anywhere on the sound shore of Ocracoke should be ideal for viewing this event. Frequent readers of this blog may remember that I have an outdoor shower that I use regularly. It is particulaly pleasant in the early morning and late at night. Bird songs add to the experience in the morning, and stars twinkling above the trees make evening showers all the more enjoyable. Early on I installed a stained glass window in the shower to give it an elegant touch. For a while I clipped I light to the outside of the frame to highlight the colors at night, and to provide a bit of illumination inside the shower, but I never felt comfortable with a 110 volt socket so close to my shower, so I removed it. Below are a couple of photos of the stained glass window after dark, one taken with a flash, the other without. As many of our readers know, NC lawmakers have passed legislation to increase fees for riding ferries in the state. The counties most effected have organized opposition to the new laws. More than 50 people recently attended the summer session of the NC General Assembly to lobby for no increase in ferry tolls. It looks now like the legislature will postpone any toll increases until at least 2014.